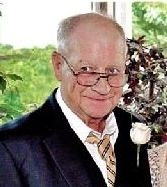 Larry Wood, 74, of Eldon, Missouri passed away Wednesday, January 16, 2019 at his home in Eldon, Missouri. He was born March 14, 1944 in Tuscumbia, Missouri the son of the late Raymond Hershel and Billie Maxine (Reven) Wood. On July 21, 1962 in Etterville, Missouri he was united in marriage to Shirley (Duncan) Wood who survives of the home. Visitation will be Friday, January 18, 2019 from 12:00 PM – 2:00 PM at Phillips Funeral Home of Eldon, MO with the Funeral Service beginning at 2:00 PM with Rev. Earl Wood officiating. Burial will follow at Mt. Union Cemetery in Brumley, MO. Memorials in his name are suggested to St. Jude Children’s Research Hospital.